Matti Friedman’s Pumpkinflowers: A Soldier's Story of a Forgotten War is a well thought out and expansively presented account of what it means to be a drafted combat solider in a citizen-solider army. 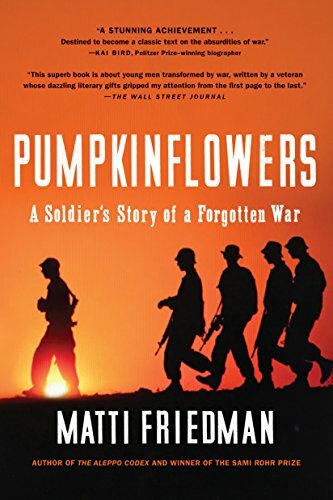 Friedman tells the story of several young Israeli men (including himself) who were stationed in the security zone in the early 90s in southern Lebanon which was in place since the end of the Lebanon War in the 80s. Friedman’s details are astonishing. The soldier’s life is laid before us, and also the wider geopolitical circumstances which brought Israeli 19 year old men to southern Lebanon in the first place. Once he is out of the army, instead of heading to India like other former Israeli soldiers, he uses his Canadian passport to travel back to Lebanon as a tourist. He even goes the southern border – Hezbollah territory – and visits his abandoned post, the Pumpkin. This last bit is astonishing, as it shows how fluid our position is, how based on perception and feeble misconceptions. As a Jew and Israeli, his gun is trained north, toward Lebanon, and he is unwanted. As a Canadian and tourist he wanders freely – is welcomed by Lebanese people as a guest in their country, and treated with utmost courtesy. Churchill: Walking with Destiny by Andrew Roberts is a stirring and detailed biography of one of the great leaders of the twentieth century. This books rings like a church bell now in a time when real leadership is as hard to find as a dodo bird. 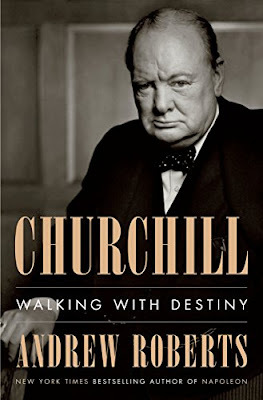 One can’t help reading this book and see that we need a person like Churchill. But Roberts’ book is not hagiography; it is a critical treatment of the man, and examines his numerous character flaws and mistakes. Yet we come away from this book with the notion that Churchill was a very unique person who through some strange alchemy could turn his personal foibles and setbacks into political capital (much like Lincoln). Roberts provides us with an account of a man larger than life, and contextualizes that life – but the context does nothing to diminish the man; and our current, anemic leaders are a disgrace by comparison. 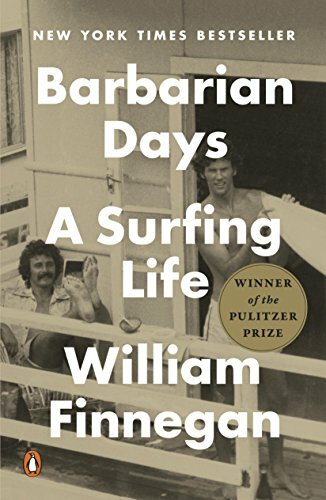 William Finnegan’s Barbarian Days is a memoir of surfing. One does not have to understand or even like surfing to enjoy the book. Finnegan takes us on a ride, explaining the mechanics of surfing, and its metaphysics and overall philosophy; even, in many ways, the spiritual religious aspects of the craft. This book is long, and Finnegan probably tells one or two too many episodic blocks of his surfing life. The New York City area surfing section, for instance, does not belong in this book. By the time we get to it, we understand all that Finnegan wants to tell us. At this point, we are chewing on cud. 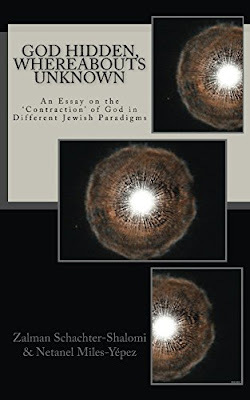 In God Hidden, Whereabouts Unknown: An Essay on the 'Contraction' of God in Different Jewish Paradigms by Zalman Schachter-Shalomi and Netanel Miles-Yepez, the authors set about to show the evolution of the concept of God, combined with the Jewish mystical notion of zimzum, or contraction. Some points are confusing. They appear to use the term theism and deism interchangeably in the text (they are not the same) but in the notes, stress that they are not doing so. Also the overall argument does not have a solid thrust, although it is there, in a latent sense. If you want to get an active sense of the importance of this essay, read Shaul Magid’s brilliant “Between Paradigm Shift Judaism and Neo-Hasidism: The New Metaphysics of Jewish Renewal” in Vol. 30, No.1, Tikkun Magazine, 2015. Magid contextualizes Rabbi Zalman’s late work, adding extra flavor to this book. 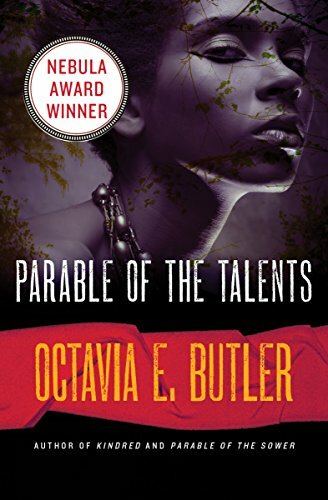 Octavia Butler’s Parable of the Talents is the second and last of her “Earthseed” books. The first book had many virtues, this volume, however, features a great deal of repetition. It repeats the first novel, and the characters go over past events without really adding any insights to the plot. All in all, Earthseed should have been condensed into one novel. 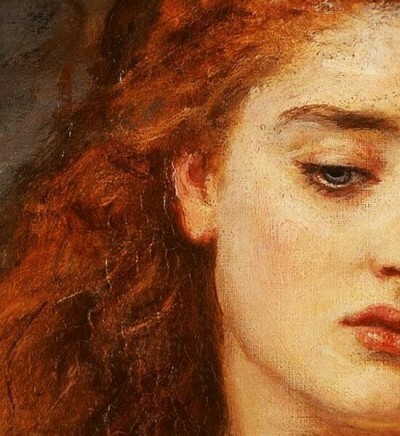 The second novel provides no added value. 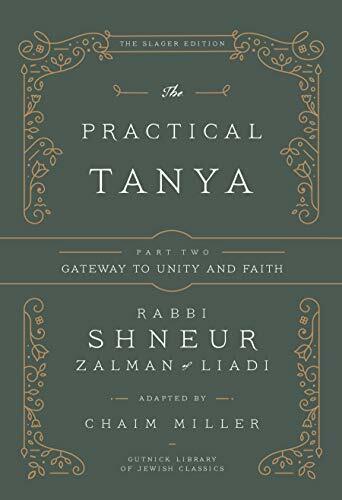 Chaim Miller The Practical Tanya Part Two - Gateway To Unity and Faith is the closest I have come to actually understanding the Tanya. Miller provides a line by line, phrase by phrase, close reading of the text, both in Hebrew and English. Despite this, I still had difficulty understanding the work on a micro level. Miller does the best he can under the confines of the Tanya’s inherent complexity. 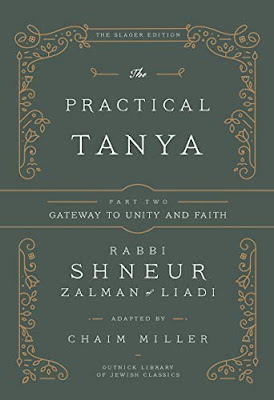 I can understand the Tanya’s goals as a whole, but individual sections, loaded with dense theological and kabbalistic explication, can still generate frustration. All Chasid’s attempt to be the heirs of the Baal Shem Tov's teachings. I wonder if the Tanya is the form through which the goal should be delivered.